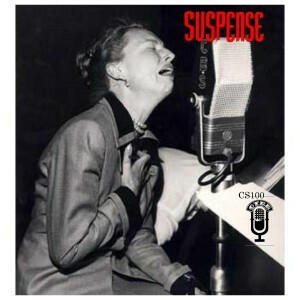 One of the premier drama programs of the Golden Age of Radio, was subtitled “radio’s outstanding theater of thrills” and focused on suspense thriller-type scripts, usually featuring leading Hollywood actors of the era. Approximately 945 episodes were broadcast during its long run, and more than 900 are extant. In its early years, the program made only occasional forays into science fiction and fantasy. Notable exceptions include adaptations of Curt Siodmak’s Donovan’s Brain and H. P. Lovecraft’s “The Dunwich Horror,” but by the late 1950s, such material was regularly featured. Alfred Hitchcock directed its audition show (for the CBS summer series Forecast). This was an adaptation of The Lodger, a story Hitchcock had filmed in 1926 with Ivor Novello. In the earliest years, the program was hosted by “The Man in Black” (played by Joseph Kearns or Ted Osborne) with many episodes written or adapted by the prominent mystery author John Dickson Carr. The final broadcasts of Yours Truly, Johnny Dollar and Suspense, ending at 7:00 pm Eastern Time on September 30, 1962, are often cited as the end of the Golden Age of Radio.